This is a rough and ready recording culled from our live field recordings. 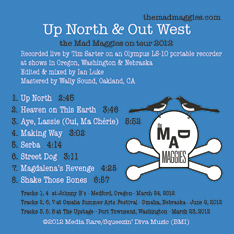 Recorded live by Tim Sarter on an Olympus LS-10 portable recorder at shows in Oregon, Washington and Nebraska. Edited and mixed by Ian Luke. Mastered at Wally Sound, Oakland, California. Heaven on This Earth — ska or is it R&B?